Explore the outdoors by wheels or water or at home! 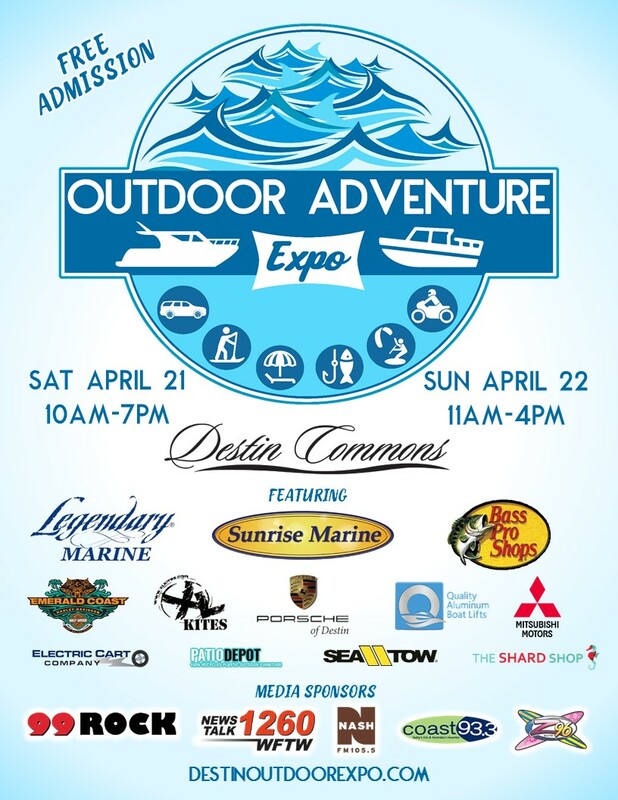 To get you ready, visit The Outdoor Adventure Expo at Destin Commons on April 21st and 22nd…and it’s FREE. For all things boating, you’ll find Legendary Marine, Sunrise Marine and Bass Pro Shops. For more “Wheels & Water” fun, you’ll find Porsche of Destin, Electric Cart Company, Sea Tow Destin, Emerald Coast Harley Davidson, XL Kites, Quality Aluminum Boat Lifts, Patio Depot of Destin, Fort Walton Mitsubishi, The Shard Shop Destin, TowBoat US, plus over 20 more vendors. Check out demonstrations to hone your outdoor adventure skills too. The Outdoor Adventure Expo is Saturday, April 21st from 10am-7pm, and Sunday, April 22nd from 11am-4 pm. Saturday, April 21 from 10 a.m. until 7 p.m.
Sunday, April 22 from 11 a.m. until 4 p.m.